Keeping track of your finances can be a major headache, so we’ve built a dashboard that will help you get a birdseye view of your financial health so that you can better plan your financial future. 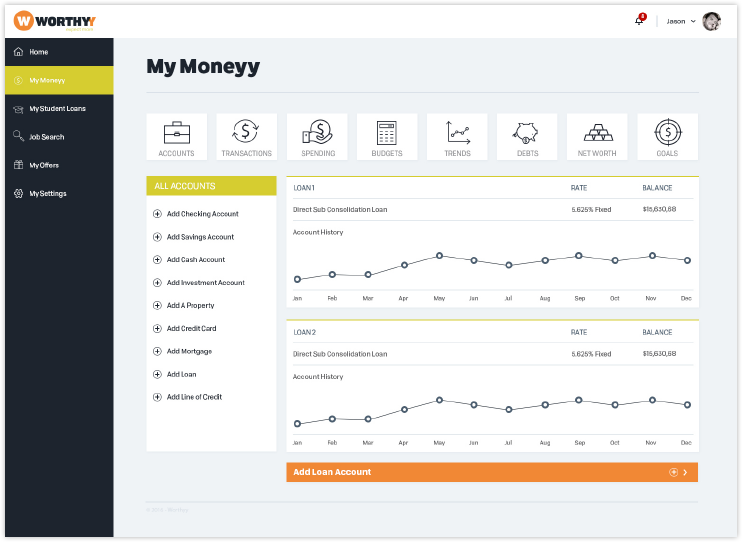 Wish that there was a dashboard that made it simple to track your financial health? We’ve built that for you. We search high and low for the best available job postings and put them right in front of you. We’ve partnered with some of the largest companies to bring exclusive discounts directly to our members. Does it ever feel like that education you worked so hard for wasn’t worth the time and money you spent? For a lot of us that is a reality. But it does not have to be. Getting on a path towards a rewarding career, and managing your finances are the two most important elements to achieve happiness. We offer amazing benefits, provided by professionals that truly care. I love that Worthyy Combines three important tools into one. It saves me time and helps me focus on keeping myself on track. I wasn’t too sure of what to expect after signing up with Worthyy, but so far the community and support has been awesome!! Not only that, but the benefits hub has saved me at least $100 on things I buy for family at the store every week. I tried using other job search tools and never got any decent offers. After stumbling across this site, they were able to help me find a new job within two weeks!